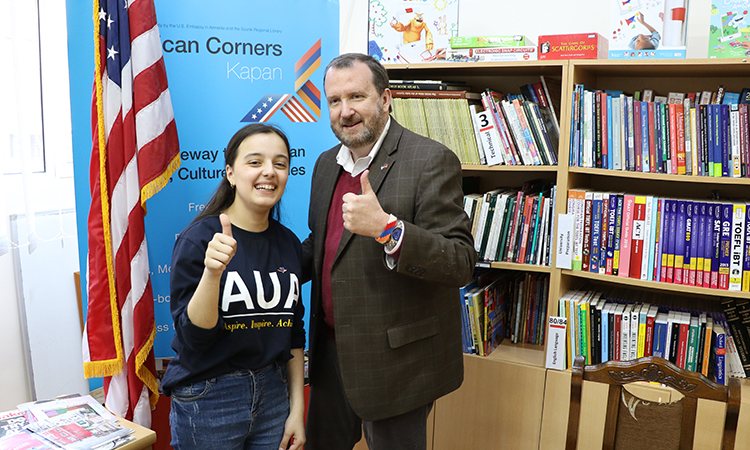 The Public Affairs Section of the US Embassy in Yerevan is responsible for the public diplomacy activities of the U.S. Embassy in Armenia, including media relations, cultural and educational activities, and the Information Resource Center (IRC). We are also a partner in the American Corners program. The Press and Media Section is responsible for maintaining contacts with the local and foreign media, preparing and distributing press releases, setting up press events (press conferences, briefings, interviews, etc.) for resident and visiting U.S. government officials, Congressional delegations, and other official visitors. The Press and Media Section also provides the local media with background information on U.S. policies, distributes selected articles and answers questions from the media. For press inquiries, please write YerevanUSPress@state.gov. To receive Current Issues articles specifically about Europe and Caucasus, please email the U.S. Embassy Information Resource Center at ircyerevan@state.gov. U.S. European Command builds partner capacity by executing security assistance and security cooperation programs using 44 Offices of Defense Cooperation (ODC) who work with their respective host nations, in close partnership with U.S. Embassy country team and under the direction of the U.S. Ambassador. Security assistance and cooperation includes, but is not limited to, foreign military sales (FMS) of U.S. defense equipment, services and training, the management of the Foreign Military Financing (FMF), International Military Education and Training (IMET) grant funding, the Combating Terrorism Fellowship Program (CTFP), section 1206/1207 funding, the Global Peace Operations Initiative (GPOI), Counter-Threat Reduction and Warsaw Initiative Funding (WIF). Additionally, these offices oversee military-to-military programs and play a key role in the State Partnership Program – an initiative that partners countries with states within the U.S. Within the framework of the Ambassador’s Mission Strategic Plan and the command’s Theater Security Strategy, these offices strengthen bilateral security relationships, enhance partner capacity and promote effective civil-military relations. ODC Armenia focuses on assisting the Strategic Defense Review conducted by the MoD, enhancing the Peace Keeping Brigade, assisting the Humanitarian Demining Center, strengthening the Armenian Rescue Service (ARS) and providing humanitarian relief to schools and hospitals throughout Armenia. The Armenian State Partner is Kansas. Kansas and Armenia have a very close relationship that span across educational, law enforcement, medical, and military emergency preparedness endeavors. ODC facilitates the visiting of professional groups from Kansas to Armenia several times per month. The monetary value of assistance provided by ODC and State Department defense related programs is mandated by Congress and fluctuates slightly each year. Over the last 4 years: International Military Education and Training (IMET) has amounted to: ~3.2 million US Dollars. This has provided military education and language training for over 100 Officers, NCOs and junior enlisted soldiers. (FMF) has amounted to ~ 42 million US dollars since 2002. FMF has been used to promote professional military education, deployable expeditionary medical capacity, procurement of communications equipment, and the enhancement of the Armenian Peace Keeping Brigade’s capability to train and deploy. Humanitarian Assistance (HA): Nearly one million US Dollars are provided annually to schools, hospitals and orphanages throughout Armenia. For nearly two decades, the United States Agency for International Development has been a leading donor agency in Armenia, managing approximately two-thirds of the total U.S. assistance program. Over this time, USAID/Armenia’s programs have evolved from humanitarian assistance, targeting the immediate needs of the country, ravaged by earthquake, war and the post-independence economic collapse, and shifted towards promotion of long-term economic development, sound social policies and democratic reform. USAID’s goal is to assist Armenia in achieving sustainable development through increased competitiveness, strengthened democractic governance, secure and reliable energy resources, higher quality social services, and a more empowered civil society. The strategic approach to realizing this vision is based on the principles of empowering agents of change, increasing Armenian society’s access to information and networks, and maximizing opportunities for alliances with development partners. The Mission has strategic objectives in five principal areas: private sector growth, energy sector, democracy and governance, health and social sectors, peace and security/cross-border activities. In these areas, USAID is carrying out an ambitious program that balances the needs for macro-level reform and sustainability with the immediate demands to improve the quality of life of the Armenian people. The USAID Mission to Armenia works with the Armenian public, the Government of Armenia, non-governmental organizations and businesses, as well as with other donors. For more information about USAID/Armenia’s activity and programs, please visit the Mission’s website at http://www.usaid.gov/armenia.